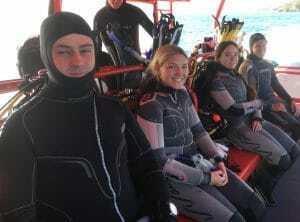 Divers: Madeleine, Adam, Charlotte, Kasper and Andrew. With the forcecast of strong southerly winds there was no chance we were going out through the heads today. But we were given the opportunity to try drift diving. While it wasn’t as scenic as other dives we have experienced it was great fun travelling relatively fast under water without having to exert much effort. Our second dive for the day was Portsea Hole. We were busy with our skills session for the first half of the dive but there was enough bottom time left in our dive plan to swim around and take in some of the scenery. After hand shakes and high-5s during at the end of our safety stop we returned to the boat as Advanced Open Water divers.